Saigon Times take two. And a big cam on to Noodlepie for excellent dining advice! 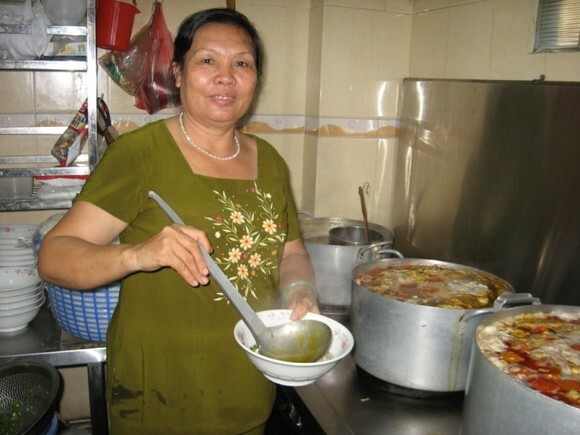 When asked how many bowls of bun rieu she sells daily at her self-named eatery in District 3, Mrs. Thanh Hai merely grins. She is unwilling to reveal to a stranger the extent of her restaurant’s popularity among locals and visitors alike. What began as a small street stall in 1984 has blossomed today into a 50-seat restaurant serving breakfast, lunch and dinner. 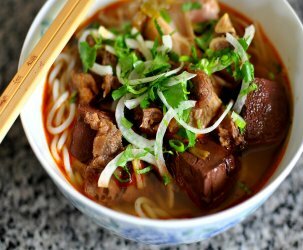 Thanh Hai has been dishing up bun rieu and a number of other snail-centric dishes in a peaceful cul-de-sac off of Ky Dong Street since 1995. Hidden away from the hustle and bustle of Saigon traffic, a meal here feels pleasantly far from the daily grind. 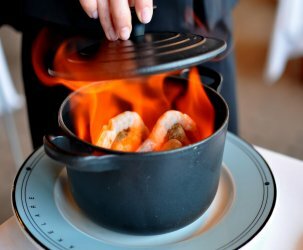 The restaurant’s recipes are original creations of Mrs. Thanh Hai and are heavily influenced by her upbringing in the northern province of Thai Binh. She has been perfecting her cuisine ever since her arrival in Saigon 26 years ago. Whereas pho has gained international admirers, bun rieu is still relatively unknown to Westerners. Fresh vermicelli noodles and a pleasantly sour crab-based broth lay the foundation for this strictly northern delicacy. Juicy red tomatoes add a robust layer of tanginess to the soup. 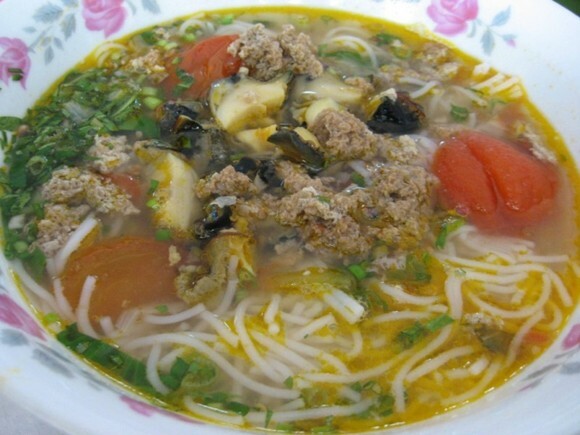 The two bun rieu selections on the restaurant’s menu are bun oc rieu cua (10,000 VND) and bun rieu cua (8,000 VND). The former includes snails (oc) and crab (cua) and is the chef’s personal favorite, while the latter contains only crab. 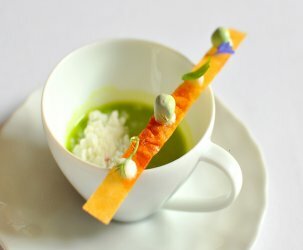 Whereas the crab absorbs the broth’s deep flavor, the sautéed snails enhance the soup’s aroma and texture. To fully experience bun rieu, a combination of crab and snails is absolutely essential. Mam ruoc (fermented shrimp paste), lime wedges, bean sprouts, herbs, and a plethora of greens are on hand for diners to personalize their bowls of bun rieu to taste. 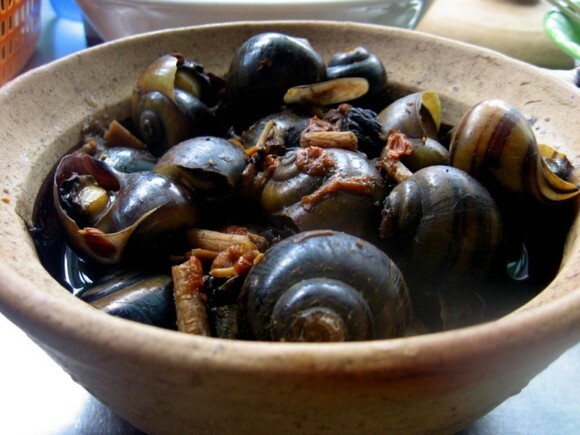 In addition to bun rieu, Thanh Hai prepares several uniquely Vietnamese snail entrees with portions hefty enough to share. 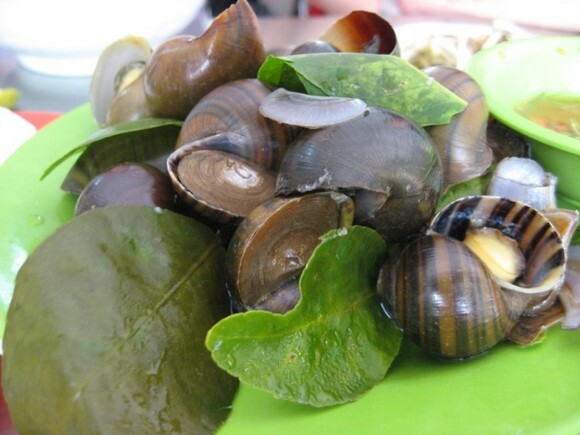 Whereas French escargot requires copious amounts of rich butter and cream, Thanh Hai uses natural herbs and spices to produce snail dishes that are much kinder on the waistline and lighter on the palate. The restaurant’s two snail standouts are oc xao chui xanh and oc hap nhoi thit. 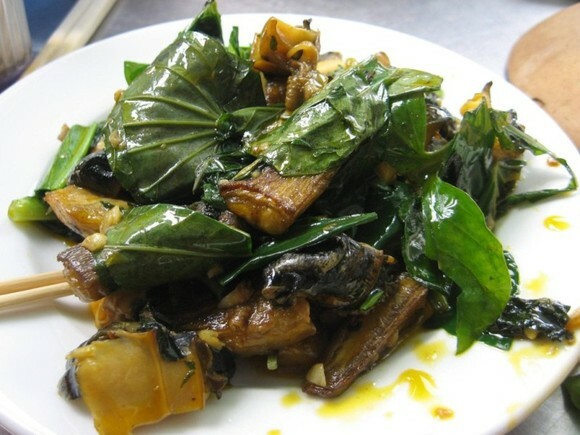 The oc xao chui xanh (10,000 VND) consists of stir-fried snails, green bananas and basil. The green bananas are starchy and nothing like their ripened counterparts, while the snails are de-shelled and agreeably chewy. The simple ingredients meld together spectacularly well, creating a flavor reminiscent of Italian pesto. The oc hap nhoi thit (25,000 VND) is the priciest item on the menu and the most popular among patrons, according to Mrs. Thanh Hai. 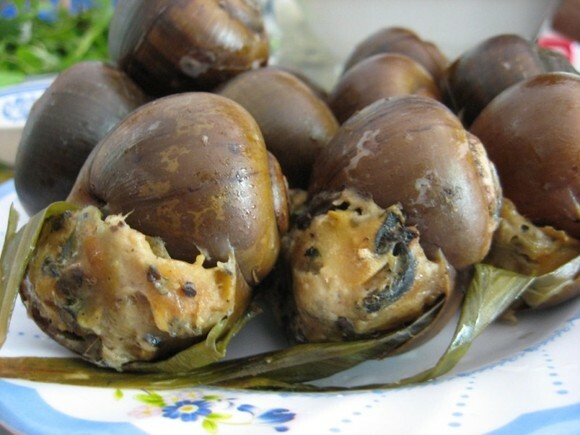 Snails, spices, and meat are combined to form meatballs that are steamed inside large snail shells. Served with a spicy ginger and fish sauce vinaigrette, this dish is immensely satisfying. Thanh Hai consistently turns out quality food at more than reasonable prices. Though a little off the beaten path, this restaurant is a true gem and is worth visiting to treat your taste buds. 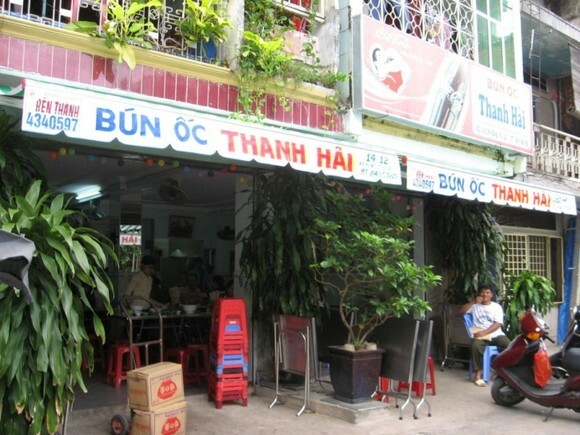 have a wonderful trip back to vietnam and try to swing by thanh hai if you have time. it’s pretty amazing how much the restaurant has grown since noodlepie’s visit! i think inflation is to blame for the higher prices. I WILL NOT attempt to look at a BLOG that has those damned “pop-up” “Word Press” balloons. Nothing is more distracting and disgusting than trying to view a blog and have it constantly interrupted with pop-ups. I apologize. He’s chewed out of his restraints again and got on to my computer. I loaded it with popups in an (obviously futile) attempt to prevent another incident. He’s tucked away safely now. Your food does look delicious, though. Too funny, Mrs. Doc Chuck! Now we know how to get him to go away. Unfortunately “Mrs.Doc Chuck” (who actually is Doc Chuck playng a nother roll) does not seem to be bothered by the pop-up ballons. I assure you that we are very different people!! This place is couple steps away from my house. I used to hate it because it was very crowded in the evening. All the motorbikes blocked the court yard. I haven’t come back there for a long time. I bet it has changed a lot. Maybe my expectation was so high after reading your blog so that I found her bun oc merely “average”. It wasn’t bad nor exceptional, just average.